Habit: Annual to perennial herb, generally taprooted. Stem: 1--several from base, generally woolly-tomentose, sometimes stalked- or sessile-glandular. Leaf: basal and cauline or mostly cauline, often +- clasping and/or decurrent, generally narrowly lanceolate to oblanceolate, entire, +- tomentose, sometimes adaxially glandular. Inflorescence: heads disciform, generally in tight groups in flat-topped to cyme- or panicle-like cluster; involucre cylindric to generally urn-shaped, +- bell-shaped when pressed; phyllaries graduated in (2)3--7(10) series, persistent, +- spreading when dry, bases generally green, distally generally sessile-glandular, tips generally stiff-papery, opaque or clear, dull or shiny, +- white, rosy, tawny, or brown; receptacle flat to convex, epaleate, glabrous. Pistillate Flower: many; corolla narrowly tubular, minutely lobed, +- yellow to +- red. Disk Flower: few; corolla yellow or +- red; anther tip +- triangular; style branches truncate, hair-tufted. Fruit: oblong-compressed or cylindric, glabrous or +- papillate; pappus bristles in 1 series, deciduous, generally free, or weakly coherent. Habit: Annual or biennial, unscented. Stem: 2--8+ dm, loosely to densely tomentose, not glandular. Leaf: +- crowded, 2--8(9.5) cm, 2--5(10) mm wide, reduced distally on stem, oblong to narrowly oblanceolate or weakly spoon-shaped, +- clasping, generally not decurrent (decurrent 1--2 mm), flat or margin slightly curled under, faces loosely persistently gray-tomentose, not glandular. Inflorescence: dense, 1--2 cm diam or +- cyme-like; involucre 4--6 mm +- spheric; phyllaries in 4--5 series, ovate to oblong-obovate, +- white, often +- yellow with age, transparent, shiny, glabrous. Pistillate Flower: 160--200. Disk Flower: generally 18--28. Fruit: weakly, if at all, ridged, otherwise smooth or papillate-roughened, glabrous; pappus bristles loosely coherent, shed in clusters or easily fragmented rings. Chromosomes: 2n=28. Synonyms: Gnaphalium stramineum Kunth; Gnaphalium chilense Spreng. 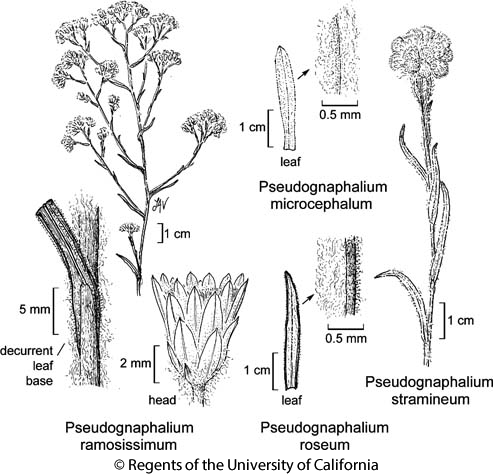 Citation for this treatment: Guy L. Nesom 2012, Pseudognaphalium stramineum, in Jepson Flora Project (eds.) Jepson eFlora, http://ucjeps.berkeley.edu/eflora/eflora_display.php?tid=40045, accessed on April 24, 2019. NCo, CCo, SnFrB, SCoRO, SCo, ChI, SnBr; Markers link to CCH specimen records. Yellow markers indicate records that may provide evidence for eFlora range revision or may have georeferencing or identification issues. Purple markers indicate specimens collected from a garden, greenhouse, or other non-wild location.